Learn a new programming language. Develop a video game. Build a website. Produce a video project. Technology education is our priority. Through exciting projects in computer programming and video game development, students learn forward-thinking computer science and problem-solving skills. Real-world tools, a 6 to 1 student to teacher ratio, integrated math instruction and project-based learning come together to forge a technology education experience that is authentic, personal, creative and accessible. Careers in software development and information technology are both high-paying and in-demand. Unfortunately, many schools and districts have been slow to adapt to our technology-driven world, neglecting computer science education until high school or beyond. 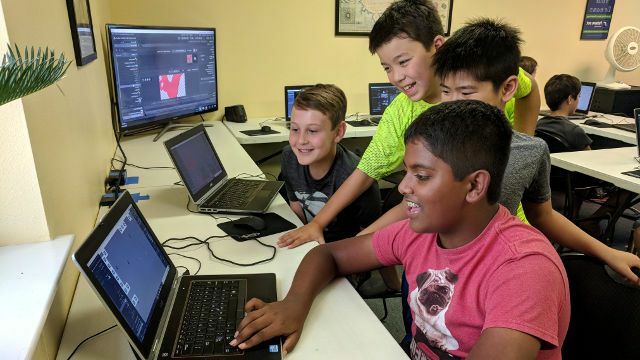 At Future Set Tech Camp, students gain valuable exposure to concepts and skills key to computer science education at an early age, laying the groundwork for success in the future. In many educational programs, learning means memorizing facts or formulas. This type of learning, rote learning, fails to facilitate conceptual understanding. As a result, students are not able to apply their learning. At Future Set Tech Camp, new skills are taught in the context of engaging projects and students are tasked with creatively applying what they learn. These methods are more likely to result in meaningful learning, or learning in which students understand concepts and are able to apply them as part of a problem-solving process. Our camp director, Eric Bennett, has lived in the Austin area since 2004 and earned his M.Ed. from Texas State University in San Marcos. He is also our lead instructor and primary parent contact, so you can be sure that your experience at Future Set Tech Camp will be conducted exactly as advertised. We teach currently relevant and forward-thinking technology skills through authentic, personal, creative, accessible projects. We use real-world tools and techniques along with concept-driven instruction. Visual models, experiments and leading questions take the place of tricks and shortcuts that circumvent conceptual understanding. We deliver individualized instruction through our low student to teacher ratio of 6 to 1. While our instructors have the experience and knowledge to take the lead, student interests and abilities are considered and supported. We challenge students to think creatively and to produce original work. Our process respects copyright law and encourages work that meets the strict guidelines of commercial digital distribution platforms. We use free and open-source software to achieve our goals whenever possible to mitigate barriers to learning. Rather than using mathematics as a prerequisite, we integrate math instruction into our technology programs. Our technology-driven summer camps deliver in-demand computer programming and mathematics concepts through compelling, challenging projects. Choose from full-day and half-day courses in computer science, video game design and more. Check out our course catalog for detailed information about all of our summer camp options. Understanding mathematics involves much more than memorizing rules or formulas. Through visual models and project-based learning, we teach conceptual understanding to help students become confident, independent and successful. Check out Math for Computer Science, our free online curriculum, to get started.